Home / Blog / Adventure Is Out There! Hey everyone! My name is Cameron Cipolla and I studied abroad in Florence, Italy last Fall of 2017. I am now going into my senior year at Belmont University where I study commercial voice. For those wondering, commercial voice really just means I am a vocalist who sings contemporary music, and yes that is actually a real major. I always thought my senior year of college would be terrifying, partially because about two years ago when my older sister, Kylie, was a senior at NYU, many of my nights included talking my sister through her many inevitable emotional breakdowns whenever she thought too hard about life after college. But, here I am, exactly where my sister was almost two years ago, except I surprisingly have very little fear of the future. I think once you’ve taken a 16-hour overnight bus to a different country, conquered bed bug bites, and traveled for ten days straight, bouncing from cheap hostel to cheap hostel as the only girl among three boys, your concept of a challenge starts to take on a new meaning and your perception of the “unknown” shifts from panic to intrigue. Sure, there are classmates of mine who have jobs secured after graduation and are perfectly content resigning themselves to immediately climbing a corporate ladder. I don’t mean to sound judgmental, as there certainly was a time in my life when I wanted nothing more than a reliable job with a steady income, but I can’t help but think about how the only thing more frightening to me than having no idea what I want to do with the rest of my life is knowing exactly what I want to do for the rest of my life. I crave so much more spontaneity than that, and though my desire for life to constantly keep me on the edge of my seat will surely fade with time, for now I cannot wait to be surprised by my own future. This newfound state of mind is largely due to my study abroad experience, so if you are anything like me and crave adventure, you are sure to find it while living in another country. 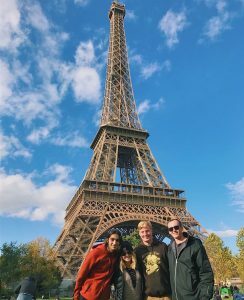 If you are like many of my classmates and aspire for consistency and dependability after graduation, I would still highly encourage you to consider study abroad, even if it is just for one summer, because there is truly never a better time to explore yourself and the world around you than while you are a student. You are literally paying money to soak in as much knowledge as you possibly can, but in the process, try not to forget that the best way to learn is by experience. 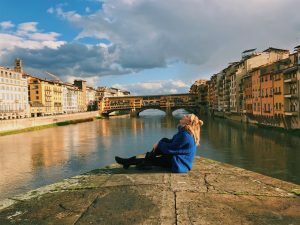 I can’t think of a situation where studying abroad would negatively impact your future career, so you might as well take advantage while you can. View from the Ponte Santa Trinita staring at the Ponte Vecchio. I may look happy here, but this photo was taken my very last day in Florence and I was definitely crying just five minutes before! 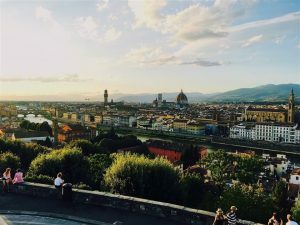 I always knew I wanted to study abroad, and my desire only increased when my sister decided to study at NYU Florence for a semester. I am half-Italian, so watching her revisit the towns we explored as young kids and finally have the chance to fully embrace our Italian culture was painfully enviable. I simply could not wait until I had my opportunity to start my own adventure, and I was determined to make it as different from hers as possible. I was craving something uniquely my own, something that nobody else could experience. While in some ways I do believe that is what I accomplished, there are still many things I could have, and probably should have, learned from my sister’s experience, and now I am hoping that you may all learn from mine. For example, when I arrived in Florence I knew how to say only one word in Italian: Cipolla. It means onion, and it is also conveniently my last name. Luckily, Florence is a bustling city with many American tourists, so for most people knowing the language was not essential towards their survival. For me, however, my hazelnut allergy combined with my lack of knowledge on how to say “hazelnut” in Italian meant my ill preparation truly did create a life or death situation. Not only was knowing the language important for my health, but I feel as if there were so many potential memories and relationships I could have made had I only been able to converse with the locals in their own language. I often think about how lucky I was, to be able to fully express myself, demonstrate my thoughts and emotions, convey my humor, and be unapologetically myself at the expense of the Italians who were forced to, in turn, restrict many aspects of their personality because they had to speak in a second language, even though I was the guest in their country. In fact, living in Italy for four months caused me to be much more expressive and descriptive when telling stories, having arguments, and engaging in discussions when I returned to the U.S. Being able to converse with people from the other side of the world without feeling obligated to limit my vocabulary was a privilege I initially took for granted, and I would encourage others who choose to study in a non-English speaking country to at least attempt to learn the language. You will inevitably still talk primarily in English, but it will at least show that you made an effort to step outside of your culture and somewhat immerse yourself in the daily life of locals in your new country. People keep asking me “what do you miss most about Florence?” Now, that just might be the toughest question of them all. This question sits right above “What was your favorite part about studying abroad?” in the list of hardest questions to answer upon returning to The States. The question is only worsened by the fact that it is scientifically proven that you remember your experiences more fondly after time has passed than while they are occurring. The boys and me exploring Paris, France, one of three countries we visited during our 10 day Fall Break. My roommate, Taryn, and me at a Fiorentina game. I learned many things from my study abroad experience, and I am sure there are still some tools I gained that haven’t even been put to the test yet, but for now I feel fortunate to finally be in a place where I can accept all of the question marks in my life and embrace them as journeys on which I have yet to embark. They may bring happiness, excitement, anxiousness, or despair, but those emotions are fleeting. What remains at the end of a successful journey is not happiness, but instead knowledge. If there is one thing I can’t stress enough to future study abroad students, it would be to take every experience at face value. It is not more, nor is it less, it just is. If you try to force an experience or an emotion, it won’t be genuine, and wisdom can only be gained organically. Even your negative experiences are simply building blocks towards a much more important moment in self-discovery—something I have to remember as I enter my final year in school and prepare for whatever lies ahead. I will remember the four months I spent in Florence for the rest of my life, and though I have learned a thing or two since then, I wouldn’t trade my experience for anything. For those about to commence their own journey: do your research, learn about the country you will be living in, try to learn the language, and be smart about your decisions, but don’t fear mishaps and roadblocks. These are unavoidable and will ultimately be the things that make your adventure completely and exclusively yours. Cameron was a fall 2017 SAI Florence student from Belmont University.